Do you want to see YOUR name on our list??? 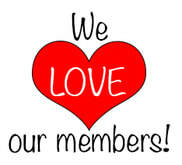 Click on the "We love our members" icon below to purchase an art league membership! They are just $15 per year for an individual and $25 per year for a family!!!!! NEW THIS YEAR!!!! We have added a Family PLUS membership for $50! This membership provides you with all of the same perks as a regular family membership but the PLUS is where the fun is!!! Family PLUS memberships include unlimited visits to Grace's Gallery Children's Art Studio. Names that appear beside a surname in parenthesis is listed under that membership.